Global sport's most famous doper is American Lance Armstrong. He's admitted to continuous doping as a world-class cyclist, and around the world he's now been stripped of seven Tour de France titles, lost his Sportsman of the Year honors, had the French Légion d'honneur taken away, etc. 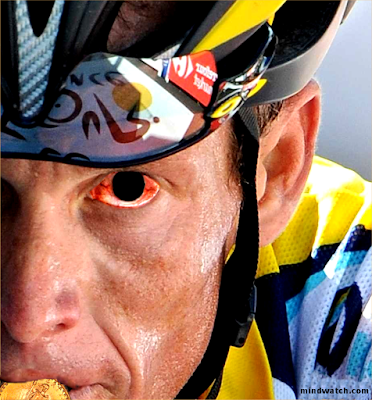 Armstrong's use of banned and illegal performance-enhancing drugs, and his admitted lies, are a stain on the USA. Meanwhile, it was totally unfair that a week before the Olympics, many blameless Russian competitors still didn't know if they'd be allowed to compete. Partisan Murdoch press & anti-Russian elements generated a witch hunt, trying to condemn people who'd been tested repeatedly without incident, and who'd competed fairly. Never forget: the admitted King of Doping Conspiracies is Lance Armstrong, representing the USA. America = the world's number one doping enabler. Land Thief Claims to be "Partner"